I may have finally learned how to beat telemarketers at their own game. Just tell ’em you’re dead. One day last week, I got a call from a Nigerian prince telling me I’d just won the lottery, and would I like to buy some Viagra with my earnings while switching cell phone carriers? Or something along those lines. We never got very deep into the conversation, because when he asked for Mark, I got all serious and said, “I’m sorry. He passed away recently.” The caller on the other end of the line mumbled his condolences and could not get off the phone quickly enough. It’s been a week since I faked my own death, and they have not called back since. Hmm. Could death be the secret to a stress-free life? I’ve tried every trick in the book to get telemarketers to leave me alone. None of them has worked, with the exception of my untimely demise. Turns out that dying was the best thing to ever happen to me! Now I’m trying to come up with other ways to take advantage of this apparently foolproof excuse. Forgot to pay the electric bill? Sorry, utility company. I died. Missed that dinner with my annoying friend who won’t stop going on about her poodle? Didn’t mean to stand you up. I was dead. Didn’t show up to work on Monday? Sorry, boss. R.I.P. Me. Turns out you have far fewer commitments when you’re dead. I should have kicked the bucket years ago! Speaking of work, my team had a very interesting IM conversation today. Kimberly was talking about how excited she was over the upcoming Wonder Woman movie. I don’t know much about WW other than the fact that she flies an invisible airplane. This became the source of an afternoon-long debate, mostly between me and Deb. I replied that WW isn’t invisible, but the plane – and, oddly enough, everything else inside it – is. Which, once you start to think about it, is mind-blowing. “Won’t people be able to kill her easily?” Deb asked. From there, the conversation devolved further. D: So the invisible plane is also bullet proof? M: One bullet won’t take down a plane. It’ll just develop a hole…which you will never see. So if a bullet pierces the fuselage and gas starts leaking out…DO YOU SEE THE GAS?? No, right? Because it’s not like you see it when the plane is fully loaded. D: What about window washing fluid? And brake fluid? And oil? M: What if there is an in-flight beverage service??? D: Do you need a special license to pilot an invisible plane? M: What if Wonder Woman brought a cat aboard her invisible plane? Would the cat be invisible? D: I DON’T KNOW. This is really messing with me right now. What’s real. What’s not. M: This is a blog post. Thank you for the inspiration, Kimberly! 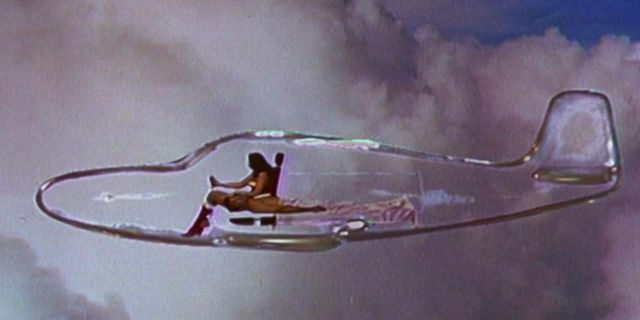 The invisible plane represented the “invisible” feminine compliance that allowed women of the Depression Era to enter and survive in the hostile male dominated work place with less resistance from that hostility. To demonstrate this, it was allegorized that the Invisible Plane would be undetected while moving quietly at super sonic speeds so that it would not be shot down by the guns of Man’s World. The idea was avoidance of conflict rather than meeting hostility head on. All along, I thought it was just an invisible plane. I certainly never imagined some deeper hidden metaphor action was happening behind the scenes. But I have an even bigger question: Wonder Woman flies, right? …so why does she need an invisible plane…? Oh, please don’t make Wonder Woman invisible. Ha! I wouldn’t dream of it. Almost all of wonder woman’s tools baffled me. Lasso of truth? Not sure I want to hear what the bad guys really want to say. A whip would make more sense. Bwhahahahahahaha! Mark, that cracked me the hell up because that’s EXACTLY what it feels like when you get on the phone with one of those telemarketers, or even when you call say, your phone service provider with an issue, and while you’re on the phone they try to sell you something new. Interesting to read about Wonder Woman because I used to watch the TV show when I was younger (with Linda Carter), but didn’t remember that she was invisible. I thought she just spun around real fast after clicking her wrist bands together. Oh, she was never invisible, Ron. Just her plane. But how she could even figure out where she parked it on the runway is a mystery I have no idea how to solve! Many years ago, before we got caller ID, I used to, in a very sad voice, tell callers that screwed up my husband’s name, that he no longer lived with me and that I didn’t have his new number. They became very apologetic and never called back. I will say this: though it was awful being unemployed, that was always an easy, honest way to get off those calls. Salespeople generally don’t like selling to people without money! Do they call her Wonder Woman because she does wonderous things? Because she looks wonderful? Because she makes you wonder? What wonderful questions, all of them!